It took a massive second-half rally, but the Denver Nuggets are back on even footing in their first-round series against the San Antonio Spurs. The Nuggets took Game 2 by a score of 114-105 to tie the series at 1-1. The win was the Nuggets’ first playoff victory since 2013, coming after a six-year playoff drought for the team. The Nuggets trailed as much as 78-59 late in the third quarter, but closed the quarter on a 16-4 run in front of a raucous home crowd. The two teams traded baskets for much of the fourth quarter, with the Nuggets tying the game with six minutes left and taking the lead for good minutes later. 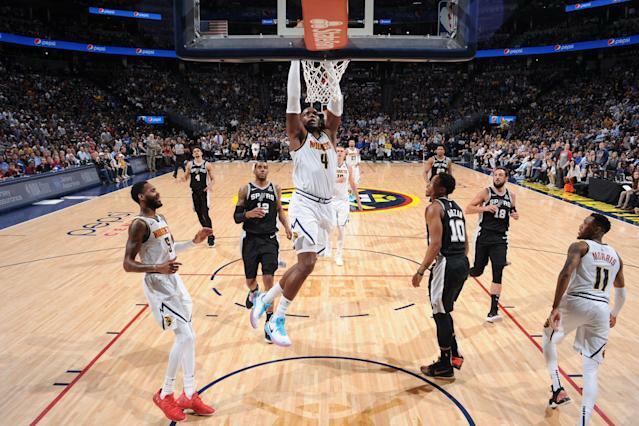 The personification of the Nuggets’ comeback was Jamal Murray, who was 0 for 8 from the field entering the fourth quarter, then ripped off eight straight baskets to pull the Nuggets well ahead in the final minutes of the game. Murray eventually led the Nuggets in points with 24, though Nikola Jokic, Paul Millsap and Gary Harris all topped 20 points. Jokic was two assists away from a triple-double with 13 rebounds and eight assists to go with his 21 points.